The Agave Landscape and Ancient Industrial Facilities of Tequila is an area that shows agave cultivation and represents the growth of tequila distillation since the 17th century. Tequila is the liquor produced from the blue agave around the town of Tequila, western Mexico. Today, the agave culture is seen as part of Mexico's national identity and is known world wide. The designated area encloses a living, working landscape of blue agave fields, with its distilleries, factories and haciendas. The towns of Tequila, El Arenal, and Amatitan are also included, plus Teuchitlan Archaeological sites from between 200 and 900 A.D.
Perhaps we should state right from the beginning that we don’t drink Tequila! So I guess that the Agave Landscape was up against it from the start with us and we certainly didn’t find it a particularly satisfactory excursion. I tried to tell myself rationally that what I was seeing was the equivalent of St Emelion in France, or Tokajii in Hungary, or Lavaux or Alto Duro ….. (there do seem to be a rather excessive number of European wine-based “cultural landscapes” which have made it onto the UNESCO list, and there are more on the T List too)! 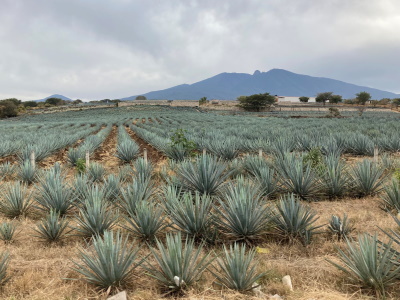 If, as a drink, Tequila can have the quality and variety of a fine Cognac or good wine and has its history engraved deeply in the countryside and culture of Mexico – then why shouldn’t its main area of growth and manufacture be similarly inscribed? Well, I guess it should – but somehow the dusty fields of Blue Agave (photo 1) didn’t seem as attractive as a hill side of vineyards! And I am afraid that the towns of Arenal, Amatitlan and Tequila couldn’t match the beauty of a French village – though the latter has a pleasant enough square and side streets. The saving grace for the Tequila landscape was its distant volcanic horizon. 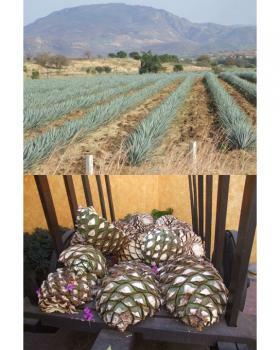 It WAS interesting to discover more about the history and manufacture of Tequila. One can appreciate the back-breaking hard work which goes into growing, harvesting and preparing this prickly unforgiving plant (It may look like a “Cactus” but apparently it is related to the Lily family!). The several commemorative statues depicting men (“Jimadores”) carrying the specialised shovel/knife (“coa de jima”) for cutting the leaves away from the bowl of the plant testified to the consciousness of the people in their history and the efforts of their forebears - it reminded me of the similar pride (and statues) in a UK mining village. Indeed we had hoped to somehow get closer to the “soul” of Mexico during our visit so “essential” is Tequila to Mexican culture and social activity – but it wasn’t to be. We stopped off in Tequila – one great similarity with St Emelion was that the town was totally given over to providing “shopping opportunities”. The main producer in town is Cuervo and it runs a comprehensive tour, tasting and souvenir “experience”. I personally thought its tour charges, considering that they were all aimed at bringing people in to buy, were somewhat excessive. At the end there is a shop with a seemingly endless range of “Tequila-related” souvenirs – we marvelled at the ingenuity of marketing men in linking just about anything to an alcoholic drink. There is also a small “museum” in town which covers the history of “tequila-like” drinks back to pre-Hispanic times and the more modern growth of the industry and its “grand families”. But I switched off at the exhibition of differently shaped Tequila bottles! We escaped to the countryside. However, nothing much was happening – the Agaves just “sat” there under the sun without even a “campesino” in the landscape! We did get to talk in our limited Spanish to a farmer who was selling the offshoots used to create the next generation of plants. Unlike wine, the process of producing Tequila requires the destruction of the plant whose surprisingly large “bowl” (photo 2) is baked/boiled and crushed to create the fermentable liquor. These “seedlings” are carefully selected and are of known provenance – just like vines. How much more might we have got from the visit if we had been able to get to a traditional “Hacienda” rather than to the town-based mega-industry we had seen! I can understand Mexicans visiting the heartland of their national drink, and the UNESCO list is gradually building up a portfolio of “food/drink-related” (agri)cultural landscapes, so Agave deserves its place (indeed I still look forward to the day when Sao Tome’s cocoa plantations make it!). But, unless you have a particular interest in Tequila, or can get closer to the source than we did, don’t expect too much from a trip out to the eponymous town.